And too be honest, I had gotten a little bored with all the Asian art. I stopped by the Home Consignment Center to sell my Baronet Java lingerie chest, and discovered HCC had bought out an art gallery which had gone belly up. Recently, I had acquired an outstandingly huge oil painting from HCC for a very good price, so I HAD to take the time to pick through the wares. Lot's of really cheesey landscapes, some awful abstracts, and other assorted interesting art, but honestly, a few really good pieces could be found. Stacked behind a HUGE picture of a lady smoking a cigarette and drinking a glass of red wine (tempting), was this little beauty for $79. Took me about two minutes to think it over, then march up to the counter. I have subsequently done some research on Ms. Cherry Murray. Her internet listings are obscure. 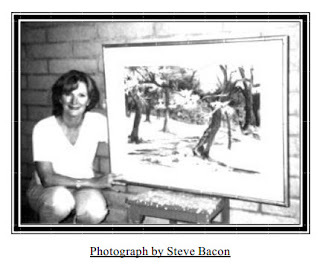 She appears to teach art classes in the Arizona with a reference on this artist bio page and a few others. And I found another reference in this newsletter from the Arizona Archaeological and Historical Society from 1999, "Memories of AAHS's second raffle in 1986, by Connie Allen-Bacon." from the University. What could I say, but, "That would be great!" and it is one of my most prized possessions. I think this reference is to the Cherry Murray that did the water color I bought. And I think Cherry Murray is out there painting and giving classes still somewhere in Arizona. So Cherry Murray, if you stumble upon this post, please contact me. I would like to know the inspiration for this picture and its province. I love it, and it is worth far more than $79. The painting is large. My dad made the mission style chair, and the end table is a very old Mission style library desk. Yes, we have mixed and matched contemporary, mid-century modern and mission in our house. So shoot me. Jonathan Adler lamp, found at a dealer for a third the price on the site. and contemporary bureau that will stay for sure. Jack's picture above was featured in Monday's Pets on Furniture at DesiretoInspire.net. Also, see the peek-a-boo view in the above picture of the track lights? Sneaky add-on during the remodel. It was honestly the only after thought we had, that we tacked onto the project. The track lights make a huge difference in our unusually large mid-century modern master bedroom and were well worth the almost immaterial dollars (considering the whole bill), to purchase them from Lightbulbs Etc. in Costa Mesa and have the electrician install them and wire the lighting to a switch while the walls were open. Brilliant. I have one of her paintings that i found here in tucson at a thrift shop, and I also have been wondering about this artist! its so beautiful!